Cannes draws a crowd looking for a glimpse into the jet set lifestyle of a Hollywood star. Those seeking a day of shopping at exclusive boutiques, or wanting to sip margaritas at outdoor tables while people watching won’t be disappointed by the exclusive atmosphere of Cannes. There’s not much to see or do here, except tan on the beach, but unlike nearby St. Tropez, Cannes is a bit more accessible to the throng of tourists who flock to check out the lifestyle. 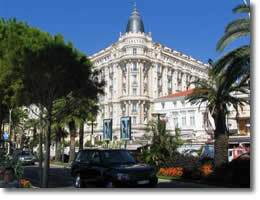 Most of Cannes beach areas are reserved for guests of the hotels that run along the beachfront on Boulevard de la Croisette. However, many of Cannes beach areas can be accessed by the public for a fee. If you’re saving your money for cocktails, there’s a public beach located near the Palais des Festivals. Also head to the west end of town for the Plages du Midi and the Plages de la Bocca, both public. Yachts are an integral part of the lifestyle of Cannes, as many oversized boats can be seen moored in the harbor. A yacht charter is an excellent way to enjoy Cannes, and there are many outfits to choose from. It’s even plausible to sail to St. Tropez, Nice, or Monaco by yacht, and with miles of coastline to explore, why limit yourself to populated cities. After tanning and celebrity stalking in Cannes France, head to L’Eglise de la Castre, an ancient castle formerly inhabited by the monks of Lerins. The 14th century Suquet Tower looms over the castle, providing excellent views. Inside is the Musee de la Castre, housing relics from the Pacific, Himalayas, and Americas. The Chapelle de Sainte-Anne, a 12th century chapel, displays musical instruments from all over the world. For shopping in Cannes France, check out Boulevard de la Croisette, home to Doir, Chanel, and Cartier. Also walk down the Rue d’Antibes, and the Rue Meynadier, which houses Marche Forville, a street market with cheap knock offs. The best known festival de Cannes is the Cannes Film Festival, which takes over the city every May. Tickets to shows are via invite only, but feel free to star watch along the boulevards. There are many other Cannes events to check out. At any time of year visit the Allee des Etoiles (stars’ walk) where 300 stars have placed autographed imprints of their hands. Two of the best Cannes events occur in July, as Fireworks explode over the bay on the 4th for America’s independence day, and again on the 14th for France. Also in July is Les Nuits Musicales du Suquet, a festival of music performances.